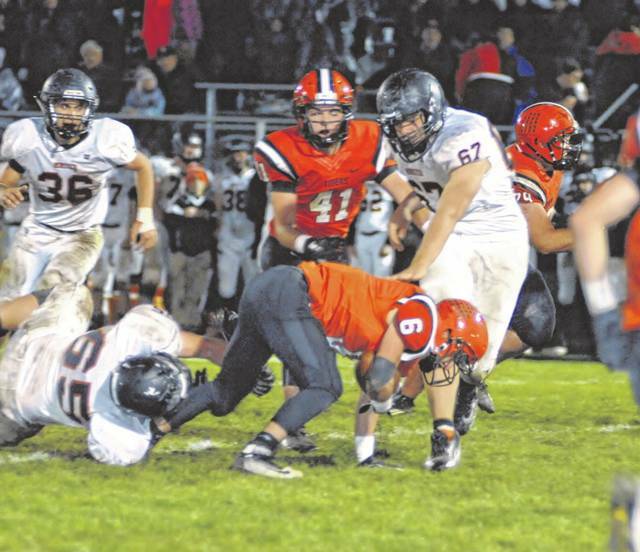 Isaac Grilliott (75) puts a hit on a Minster player during the Tigers last home game of the season on Friday. The Wildcats shut out Versailles, 32-0. Jake Poling (6) stumbles forward for a few extra yards during the Tigers last home game of the season on Friday against Minster. The Wildcats shut out Versailles, 32-0. Nathan Wagner (25) runs out of a shoestring tackle during the Tigers last home game of the season on Friday against Minster. The Wildcats shut out Versailles, 32-0. 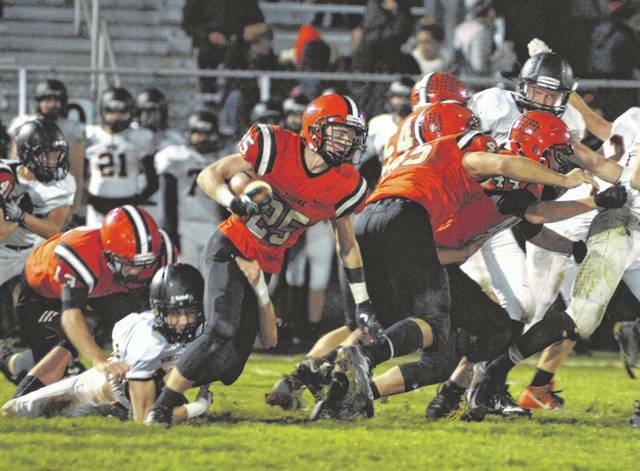 Nathan Wagner (25) makes the tackle on a Minster ball carrier during the Tigers last home game of the season on Friday. The Wildcats shut out Versailles, 32-0. Ryan Martin (11) throws a pass during the Tigers last home game of the season on Friday against Minster. The Wildcats shut out Versailles, 32-0. 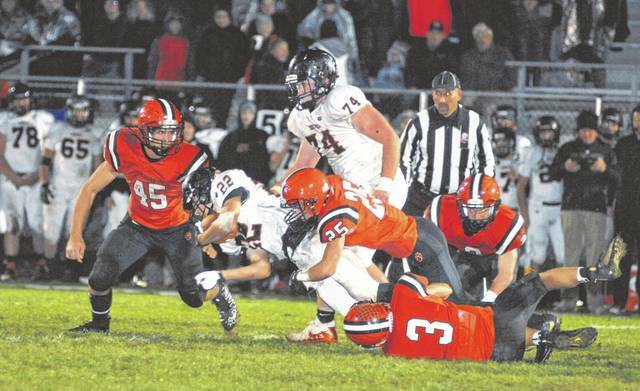 VERSAILLES – It was Senior night in Versailles, but it was Minster who was celebrating after shutting out the Tigers 32-0 on a cold rainy Friday night in Versailles. 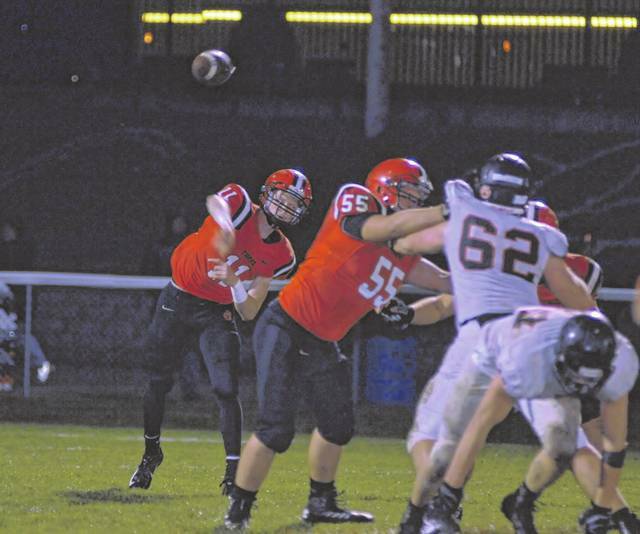 The Versailles offense struggled to move the ball putting the Tiger defense on a short field. The Tigers average starting field position was their own 22, while the Wildcats average was their own 42. The Tiger offense generated 155 yards of offense – running for 72 yards and passing for 83 yards. 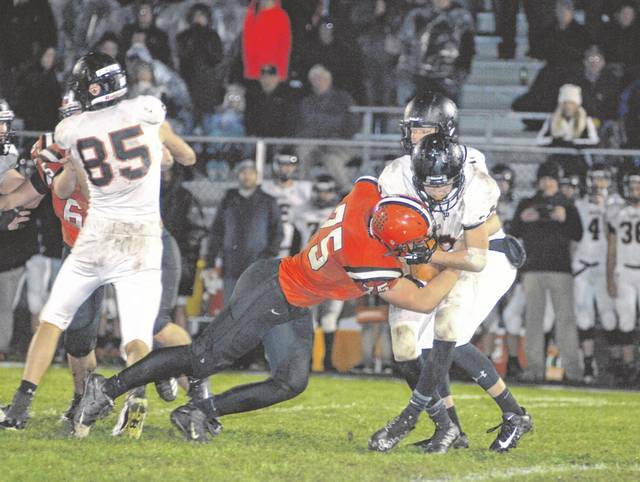 Minster had 383 yards of offense with 214 coming on the ground and 169 through the air. Minster scored midway through the first quarter on a 29-yard run by Alex Schmitmeyer to take a 6-0 lead. The extra point was missed. The Wildcats scored twice in the second quarter on pass plays to take an 18-0 lead. Both extra points were missed. The Tigers received the second half kick and moved to the Wildcat 21-yard line. Facing fourth and 4, the Tigers went for it on fourth down. A quarterback run resulted in a turnover on downs as Ryan Martin was short by about a foot. The Wildcats took over at the 18 and were called for a hold. The ‘Cats moved out to the 21 when Schmitmeyer took off for a 79-yard touchdown run. The Wildcats made their first extra point and took a 25-0 lead. The Tigers muffed the kickoff and had to start at their own 9-yard line. A three and out with a bad punt put Minster at the Tiger 33-yard line. The Wildcats scored on the first play with a 33-yard touchdown pass. The score came just one minute and 11 seconds after scoring their last touchdown. The resulting score started the running clock. The Wildcats threatened to score again after an interception at the Tiger 21-yard line but missed a field goal at the start of the fourth quarter. The backups played most of the fourth quarter. The Tigers will travel to Fort Recovery to finish out their 2018 season. The Indians are 3-6 on the season. This entry was tagged MAC, Minster Wildcats, Versailles Tigers. Bookmark the permalink.